NAS Data Recovery recovers the entire content of your broken NAS within minutes. You will be able to copy the files and folders over to another disk. NAS Data Recovery works for all XFS- or EXT-formatted single-drive, RAID-0, RAID-1, or RAID-5 NAS stations from manufacturers such as Buffalo, Seagate, Western Digital, DLink, or Iomega. Remove the drives from your NAS station and attach them locally to your machine. Make sure the drives are all recognized by Windows Disk Management. If you are trying to recover a RAID-5, it is Ok to attach one drive less than the total number of drives in that NAS. NAS Data Recovery also works with images of your drives. Install NAS Data Recovery to your computer and start the program. In Vista and above you need to right-click the program icon and select "Run as Administrator". NAS Data Recovery is easy to use. It automatically finds all parameters needed for the recovery, such as RAID start sector, stripe size, rotation, and drive order. Everybody is now able to recover his own NAS. No data recovery background required. No need to buy any other software. 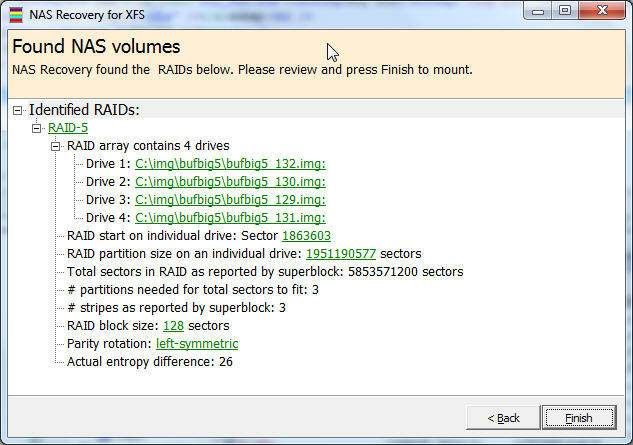 If you want to recover a Windows RAID, check out our RAID Recovery for Windows software. For other kinds of RAIDs see our RAID Reconstructor software. If you need help with an exotic RAID, check out out RaidProbe service.